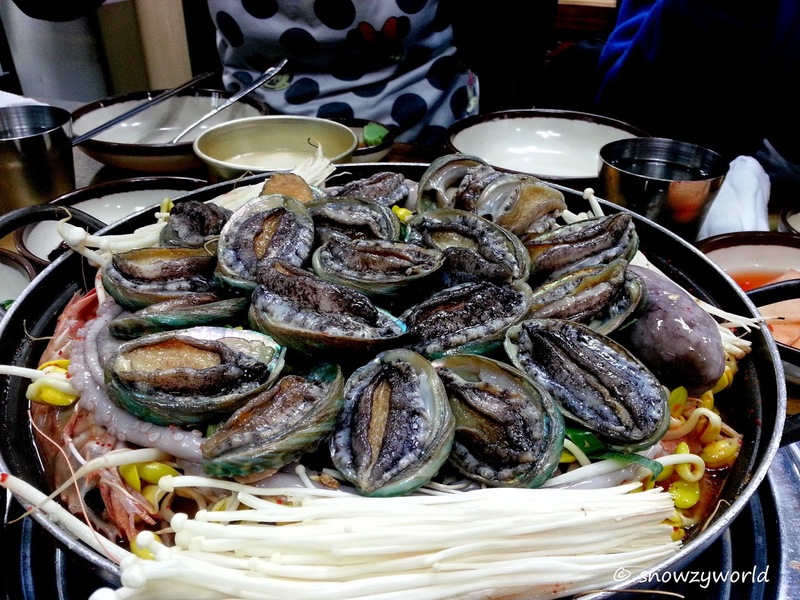 I still cannot forget the taste of the impressive pot of seafood stew we had in Jeju. Despite us having just had a full breakfast of porridge and such, we decided to order the big pot costing KRW 45,000/- (about SGD55/-), hey come on, there’s 5 of us and there’s only 100 pots a day! We just had to clear some stomach space for it. 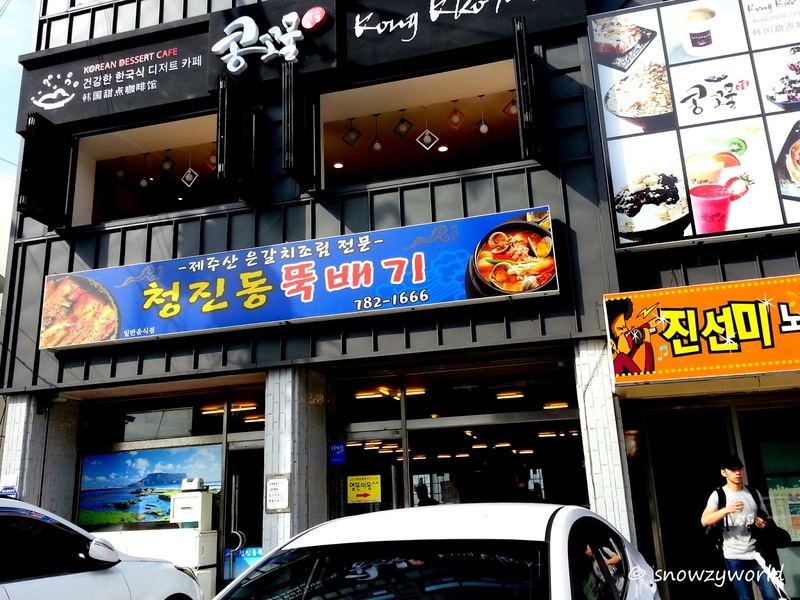 Mike’s friend recommended us to this restaurant at Sunrise Peak (Seongsan Ilchulbong). A traditional Korean restaurant where you have to sit cross-leg on the platform with low dining table. The restaurant to go! 100 seafood pot a day! 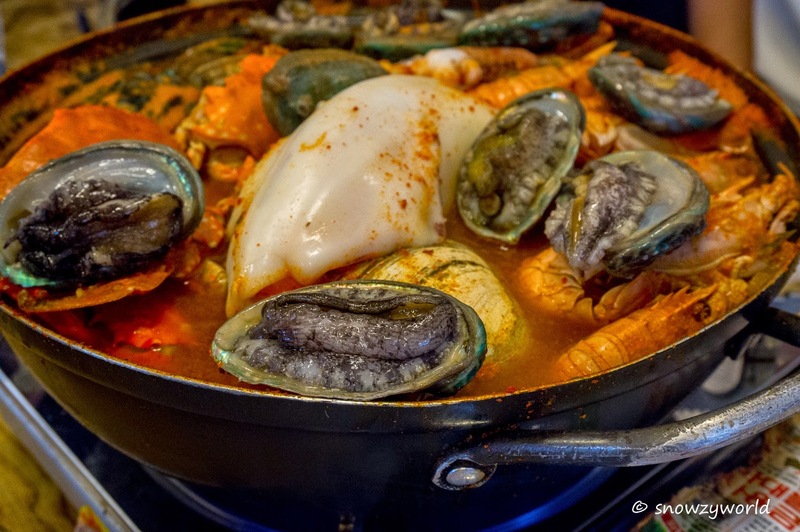 The bubbling pot of seafood stew was served on a stove set at high boil. We were all in awe.. a total of about 12 baby abalones, still alive, squirming away. There’s also a big squid, which I believe was still alive too. There’s more surprise in this pot as you dip your ladle in.. a bountiful harvest of seafood here – yabbies, flower crabs, clams..etc. All for just 50 bucks! The waiter later will flip all the abalones over to cook and viola, we were all ready to tuck in. 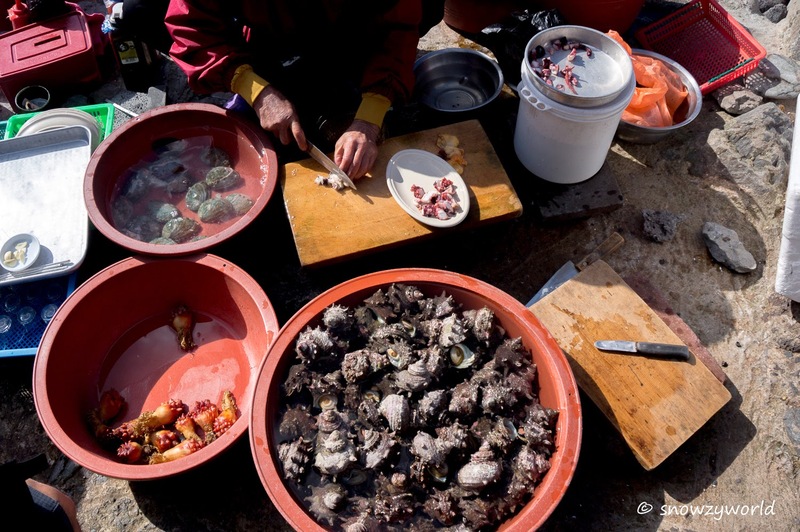 The baby abalones were really fresh and springy to bite but don’t let abalones cook for too long, else it will be too tough and rubbery. With so much seafood shimmering in the pot, the broth was really tasty! Spicy, yet refreshingly rich in taste. Be prepared to sweat throughout the entire meal! The heavenly no other place seafood pot! We had another round of spicy seafood stew at a restaurant next to our hotel at Seogwipo after our Hallasan expedition. The pot we had cost about KRW55,000 and there was about 20 baby abolones! A big octopus, with yabbies, squids, clams and lots and lots of soybean sprouts. The broth, however was not as shiok as the one we had at Sunrise Peak. Before our heavenly spicy seafood stew, we actually had our breakfast opposite the seafood stew restaurant. 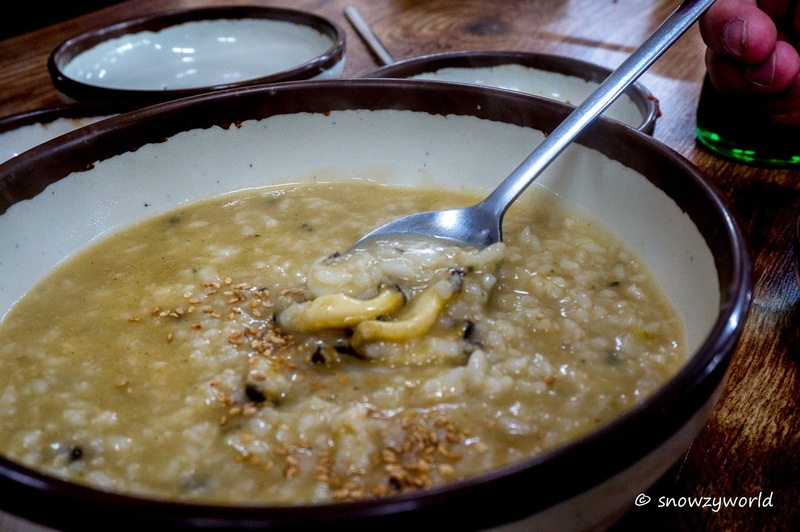 We ordered abalone porridge which was so tasty and flavourful! I think the Koreans do their porridge really well. 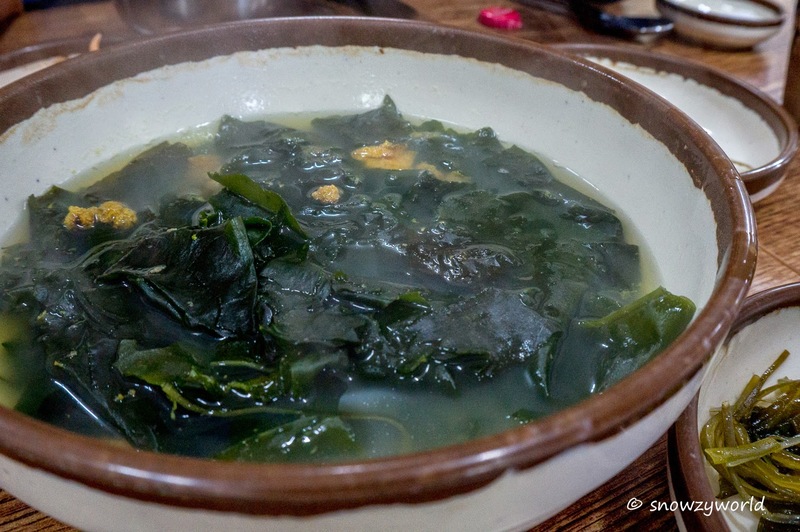 Also ordered the sea urchin seaweed soup. Must be the proximity of the sea. Seafood here are all so fresh. There’s so much sea urchin in the soup and the sea urchin taste so fresh and sweet. Highly recommended! 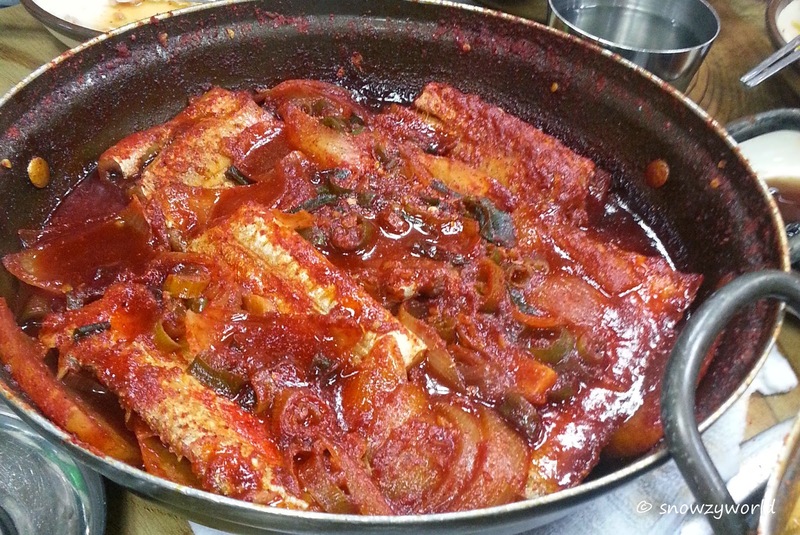 We see hairtail fish everywhere in Jeju since it is found in the water around Jeju. 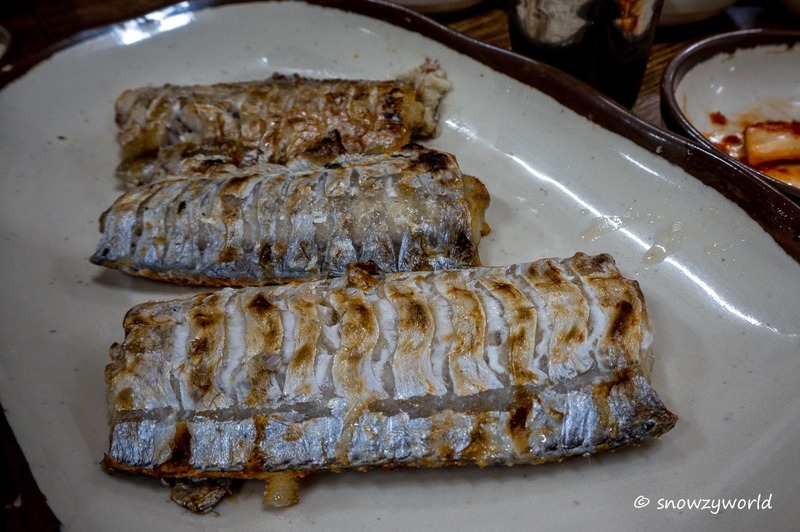 There are a few cooking method for the hairtail fish. We had it grilled and braised. Nicely salted and grilled. Crispy outside with the meat soft and sweet. Braised in spicy hot sauce, the sauce taste good especially with their pearl like rice. 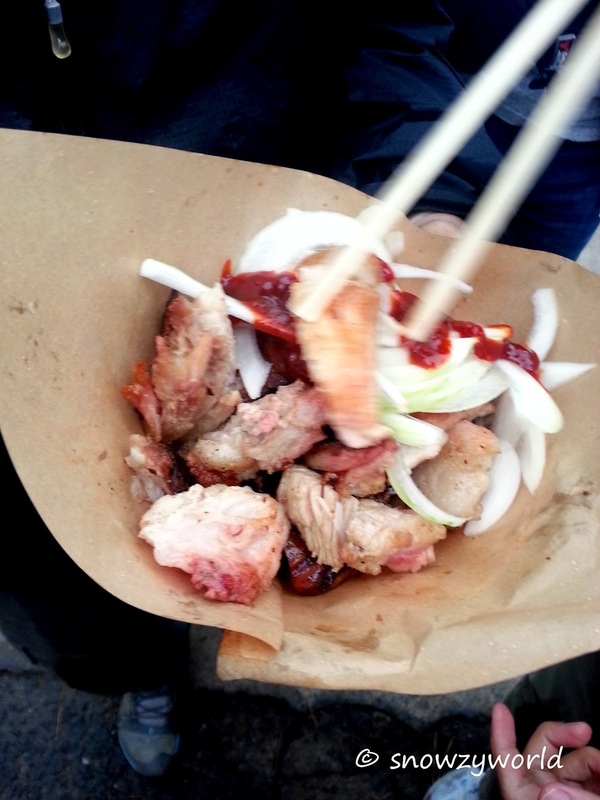 We do not have the time to travel up to Jeju-si to have black pork there as we were based in Seogwipo-si. Nevertheless, we still managed to find a restaurant, recommended by Mike’s friend. We had a hard time finding the restaurant as this round our car GPS failed us. 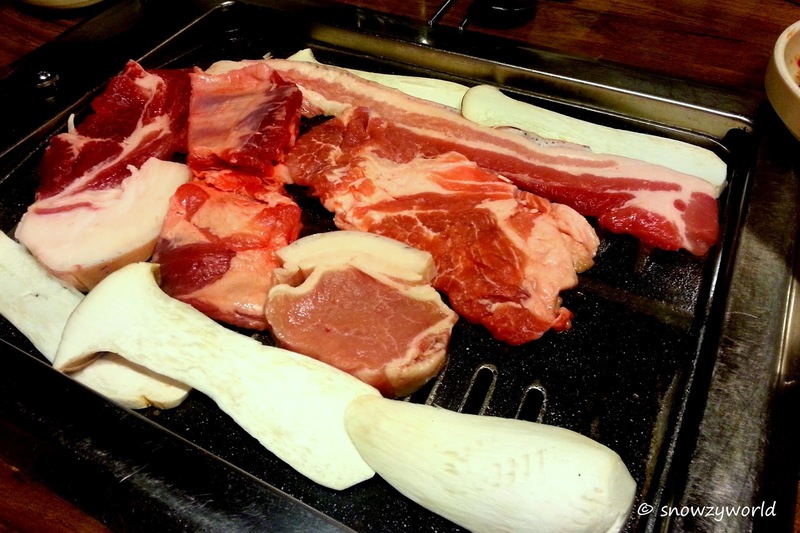 In the end we realised that it was very near to our hotel — Saeseom Galbi. 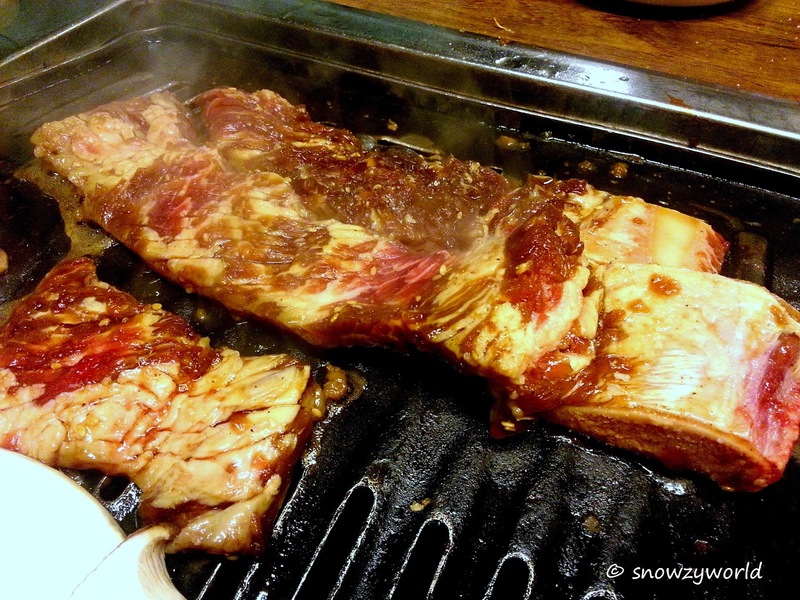 The meat was not marinated, so after BBQ-ing, will usually put in lots of sauce and stuff from the side dishes and wrapped it with the vegetables given. I wondered if we over cook it, I did not find it really good. BBQ black pork, see the black hair? I guess the winner was the beef! Well-marinated and we can’t help it but to order a 2nd round! Another place to satisfy black pork craving will be here! 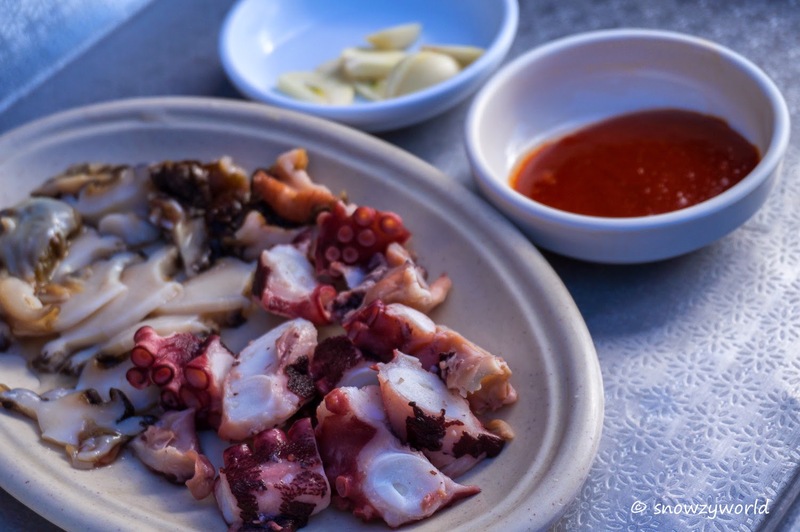 Seriously, I find it’s the best in Jeju! A little stall located just next the the Mysterious Road, we called it the Ninja Black Pork! 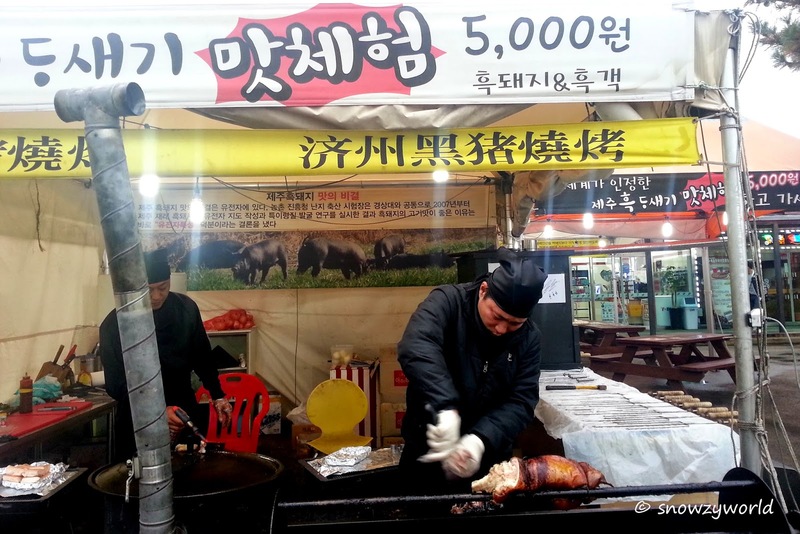 Forget about the Mysterious Road, just come here to eat the black pork! Nicely flavoured and BBQ-ed. The meat so soft it can almost melt in your mouth. Yums, I am salivating now as I am writing this post! Gosh! I missed the meat now!!! 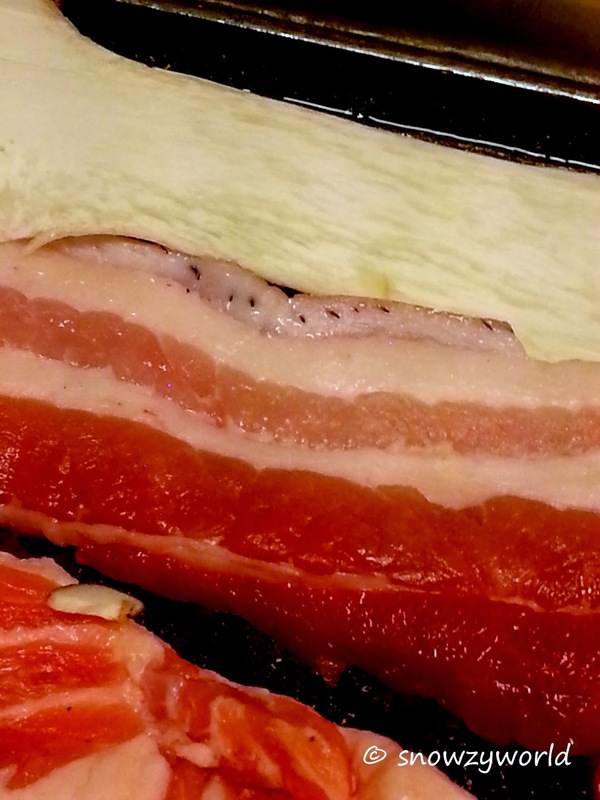 It’s melt in your mouth black pork! At the waterfall, you will see Ajumma there serving out the seafood, some look really weird. Not cheap, KRW20,000 for this plate with 3 types of seafood. You can really taste the freshness of the sea! Kenn likes it but I find the clam-like stuff to tough for bites. Fresh seafood on the go! hi, the 100 port seafood a day looks good however, may i know whats the address for it? Hi.. really interested in that 20 baby abalone stew!! Wondering which hotel did u stayed in at seogwipo? We stayed at Lux Hotel which is a short drive to sunrise peak. For seogwipo we stayed at Hotel little France. The stew shop is just nearby on the main road. May i ask where did u had your abalone porridge, sea urchin seaweed soup, and hairtail? I had it at a random restaurant near Seongsan Ilchulbong's visitor centre. If you drive, you may key in this GPS (782-1666) which is where the seafood pot is. The porridge restaurant is just opposite. Thanks for the reply, really appreciate it! !